In short yes. It’s not an exact science but battery voltage will give you a very rough indication of battery capacity. Lithium on the other hand is extremely difficult to determine capacity due to the very flat voltage curve that lithium batteries have. Let’s look at this a little differently. You’re out in an isolated remote area and you don’t have a fuel gauge in your car. You’ve travelled 400km since you refilled and have 500km to go. 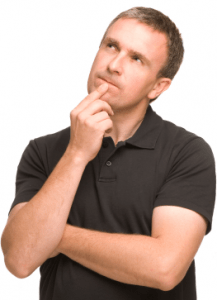 You think that you have used around half of the tank capacity but you are not sure. The only way you have to determine how much fuel you have left is by 2 methods. 1: Put a stick into your oddly shaped fuel tank to try and register how much you have left. 2: Tap up and down on the tank wall until you hear a change in pitch to roughly guess how full it is. From this rough method, you now have to decide if you have enough to go the extra 500km or do you turnaround and go back the 400km and play it safe. Basically, you wouldn’t drive your car without a fuel gauge, so why would you run your power system without any monitoring. Tapping on the side of the battery or sticking a stick in the top will tell you absolutely jack. The only way to accurately determine you battery capacity is by a proper battery monitor system. A fully detailed battery monitor will show you battery voltage, live current flow in and out of the battery, amp hours you have removed/charged, time remaining and the all-important state of charge (SOC). The SOC is exactly like the fuel gauge in your car. The Enerdrive ePRO PLUS is our latest generation, highly advanced battery monitor. It consists of an intelligent shunt and a remote control and display unit. This advanced battery monitor not only shows the true state of charge of your battery system. It also offers a large amount of additional features to optimally supervise your battery system and control external equipment. The ePRO PLUS is compatible with all lead based batteries and (LiFePO4) Lithium batteries. 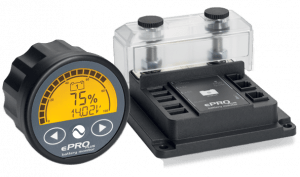 Unlike the well-known Enerdrive eLITE and ePRO battery monitors which are based on a passive shunt for current measurement, the new ePRO PLUS is equipped with an active shunt module. All measurements and calculations are made inside the active shunt module, resulting in the highest accuracy. The end results are transferred to the remote display over a digital cable connection, ensuring the highest immunity against external interference. 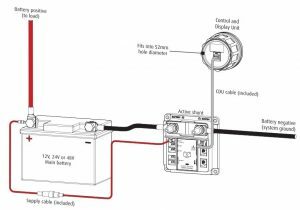 The installation time is minimal, requiring only one supply wire to the intelligent shunt base and a single plug and play ‘QuickLink’ cable between the shunt base and the remote display. Furthermore, the battery minus cable must be interrupted in order to insert the shunt into the high current circuit. The fused supply wire and the QuickLink cable are both included in the package, avoiding the need for a separate connection kit.